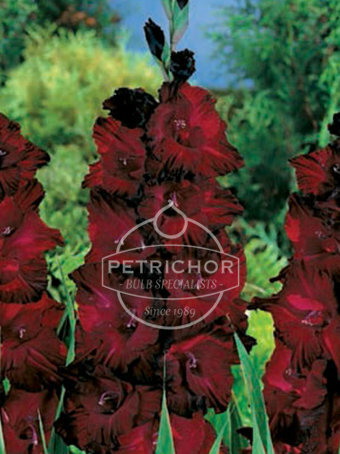 A beautiful large dark flowering Gladiolus. - Plant when danger of frost has passed and the ground has warmed. - Plant 2-3 times the depth of the bulb and 15cm/6” apart. - In well drained moist soil, in a sunny position. - Gladioli prefer to be in spaces where no other plants compete with them. - Water regularly as the growth begins to appear. - You can hill up the soil when plants are about 15cm/6” tall to help support the stems. - Dead head as necessary, but leave foliage. - Bulbs will winter in the ground if they are in a warm sheltered position. - If exposed and prone to cold conditions Gladioli will benefit from lifting and storing in a frost free location. - The smaller or mini varieties of Gladioli, such as nanus or colvillei are in general hardier than the larger variety. - Acidanthera, contrary to general belief, is not hardy and needs lifting and storing unless your own experience has proved different.